Ron and Leetal Arazi of NYShuk are on a mission to teach Americans about real, hand-made couscous. (The stuff in the box? Not it.) From their brownstone in Brooklyn, the Israeli-born couple painstakingly rolls semolina flour with water to create fluffy, authentic couscous—it’s so good that Daniel Boulud has just started serving it at his flagship, Daniel. They came by the Food & Wine test kitchen to give us a taste and to set us straight on their favorite subject. 1. The Romans might have invented it. “The history of couscous is controversial!” says Ron. Many cultures in North Africa now consider couscous their own, but it may have originated way back when the Romans ruled the region and used Tunisia as the breadbasket of the empire, planting it with wheat. 2. Couscous is not a grain—it’s more like pasta. Semolina flour is spritzed with water and rolled by hand until tiny balls form and reach the desired size. NYShuk makes six different sizes ranging from tiny bits smaller than poppy seeds to chewy balls the size of large chickpeas. No matter the size, the couscous is steamed three times before serving. 3. It's not a side dish; it’s the main event. According to Ron, instant couscous is nothing more than a gummy delivery system for whatever else is on the plate. 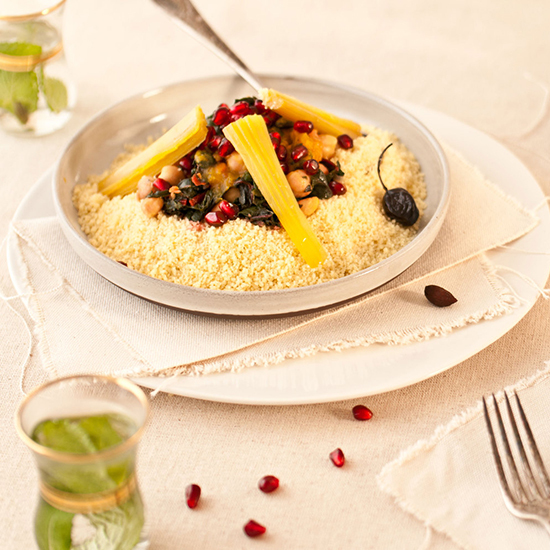 Real couscous, on the other hand, is an incredibly delicious textural experience that is the centerpiece of the meal. Ron and Leetal also make three amazing Middle Eastern condiments, including harissa, which can be found at mouth.com. Go to nyshuk.com for the couple's recipes.